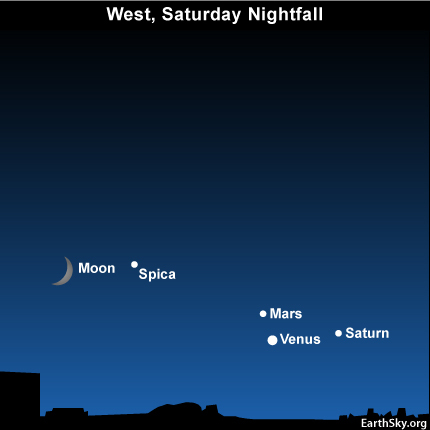 In the west after sunset tonight, you will find Spica and the waxing crescent moon. The planets to the right of the moon are Mars, Venus and Saturn. Of those planets, Venus will be easiest to see because it is so bright. You might need binoculars for Mars and Saturn. Spica is known as a blue-white star. Can you detect its color in contrast to nearby stars? If not, try looking at Spica with binoculars. Spica isn’t just one star. Although our eyes see just one star here, Spica is actually a multiple star system. Spica is the brightest star in the second-biggest constellation Virgo the Maiden. Some say that Spica translates to mean ear of wheat. On old star charts, this star is often pictured as a shaft of wheat held in the Maiden’s hand. Since Spica is near the ecliptic –or path of the sun, moon and planets across our sky –, it is sometimes covered over by the moon. Planets sometimes pass in front of Spica, too, but no need to mark your calendars. The last time the planet Venus passed in front of Spica was November 10, 1783 and the next time will be September 2, 2197. In September of 2010, both the planets Venus and Mars will have a conjunction with Spica. On September 1, Venus passes 1.2 degrees south of Spica, whereas Mars passes 2 degrees north of Spica on September 4. However, these two planets will not pass directly in front of Spica. Now for a riddle. What is 4.5 billion years old, but is new again every 29.5 days? You guessed it… the moon. The moon is considered to be new when it is most nearly between the Earth and sun in its monthly orbit around Earth. Site contents copyright © 2019 Recorder Online	except as noted. All rights reserved. | 88 queries in 2.275 seconds.